The Costume: Unless you've been spending the last year or so in the remote wilds of someplace or other, it is quite impossible not to recognize the lovely Elsa from Disney's animated feature, Frozen. Choosing a Character: It's really a special thing when you are able to find a character that is not only a lot of fun to dress as, but also resonates with you as a person. Jenifer chose to dress as Elsa not for all the obvious reasons, but because Elsa was the first character in whom Jenifer was able to see someone who struggles with anxiety and depression but was not the villain of the film. And for those of us who face challenges like these and more in our daily lives, Elsa is more than just a pretty lady with even more pretty/icy powers. She is a character to whom we can relate. Favorite Part of the Costume: The cape, it makes her feel majestic. And might I personally add, the loops were a great idea, functional and add a nice bit of drama! Biggest Cosplay Challenge: The bodice. Choosing a multicolored bodice to represent the way ice can reflect the colors that surround it was a really visually striking idea. Sadly, it was not an easy task. When Jenifer's first attempt to make the bodice changed color as a result of some fabric glue she used, she had to regroup and come up with a new plan. 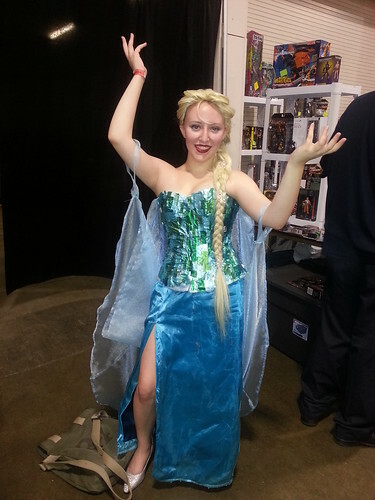 Cosplay Experiences: Jenifer has been cosplaying since February of 2013 and is happy to say that her experiences have been mostly positive with a few exceptions. When we chatted, she took a moment to mention what a great time she was having at Boston Comicon. Truth be told, based on how everyone (especially the younger kids) was reacting to her costume, I can't say that I was surprised to hear it. Thoughts on Clown Spiders: Jenifer was gracious and accepted a sticker with our would-be mascot on it, but shared that while a fan of clowns, spiders fell into the category of things she found terrifying. Sounds like Tiny Doom can add another member to her "Spiders are Horrible" club. Jenifer, thanks so much for taking time out during your busy day! And for those of you who want to know more about this cosplaying lady, you can follow her Tumblr.